The Indian summer monsoon typically makes its way to Indian subcontinent via Kerala by the end of May. With less than three weeks to go, there is little clarity on when exactly the monsoon will arrive this year and how it will progress thereafter. While extended range forecast models show some signs of an early onset, other meteorological conditions surrounding the monsoon have shrouded the forecast in uncertainty. The winds that usher in the monsoon in India arrive from the east in the equatorial belt of the southern Indian Ocean. As the winds approach the Africa’s east coast and cross the equator into the northern hemisphere, a change in direction is affected and the winds become westerly—they flow from the west. Accumulating moisture from the Indian Ocean, the winds enter India through Kerala and proceed to cover the country over June and July. Simultaneously, the westerlies also take a circuitous path around the country and over the Bay of Bengal to bring rainfall to the northeastern parts of the country. Are we expecting an early monsoon? The numerical forecasting model used by the Indian Institute of Tropical Meteorology (IITM) for extended range forecast that predicts wind patterns at an altitude of about 1.5 km and precipitation shows that based on the initial conditions of May 10, there is a possibility of early arrival of monsoon on the Kerala coast around May 25. IITM’s forecasting model shows reversal of winds over the Arabian Sea which typically precedes the onset of the monsoon over the Indian subcontinent occurring next week. This is followed by a spell of rain on the Kerala coast as well as a concentrated spell of rainfall due to monsoonal winds in the last week of May in northeast India. While this seems like a clear indication of an early onset of monsoon, the equation is not quite so straightforward. Reversal of winds is a criterion for declaration of the monsoon, but current observations do not conform to typical organisation of monsoonal winds. The onset of monsoon in Kerala is preceded by monsoonal showers in the Andaman & Nicobar Islands. The winds normally take about a week to 10 days more to reach the mainland. However, experts suggest that there is still no sign of typical monsoonal organisation in the Andaman region. Thus, it casts a huge doubt on the possibility that the country is set for an early onset of the monsoon. “The monsoon usually reaches A&N islands by May 15 and covers the entire islands by May 20. The cross-equatorial organisation required for monsoon circulation is not visible yet, and can only be seen organising after May 20. I don’t see any possible monsoon activity over A&N until May 23. Beyond this, the winds reaching Kerala and making further progress depends on local factors around Kerala coast. But, it is extremely unlikely for monsoon to proceed from A&N to Kerala in two days,” says Akshay Deoras, an independent weather forecaster. Deoras’s hunch is confirmed by Sivananda Pai, IMD’s chief long range forecaster. “There is still no certainty over the onset of monsoon over Kerala yet. There are no indications of monsoon organisation in A&N till now, so it has to first be seen over Andaman before more accurate predictions can be made,” he says. A second area of concern regarding monsoon is the volume of rains that has been predicted. Northeast India has been experiencing heavy showers since April and IITM’s model predicts intensification towards May-end and beginning of June. However, the western coast, from where the monsoon is said to enter the mainland, is seen to bring just 2-4 mm of rains in peninsular and central India. The weak rainfall signals a strong uncertainty over strength of monsoonal winds that are shown to arrive on Kerala coast around May 25. Meagre rainfall at the end of May might, in fact, be the residual rains from a possible cyclonic circulation over the Arabian Sea. Interestingly, the forecast model indicates formation of a low-pressure zone around May 19 near the tip of the subcontinent. However, rather than proceeding east-northeastwards towards Kerala and the rest of India, the low pressure system and associated rains are seen to move away over the Arabian Sea towards the Arabian Peninsula. According to the weather status issued by the IMD on May 10, a similar low pressure zone is currently brewing over the Arabian Sea and is likely to move towards the coast of Yemen in the coming week. Temporal and spatial distribution of monsoon once it arrives is another crucial factor. This is where the picture seems to get infinitely murkier, with the recent spate of thundershowers having more than a minimal bearing. After a winter of severely deficient rains, frequent spells of unseasonal rains, hail and stormy weather have hit large parts of the country. The most damaging of these has been the widespread dust storms and thunderstorms that struck several states in northern, western, central and eastern India, causing deaths of more than 160 people. The unusual intensity of the storm was due to active western disturbances. Jet streams associated the western disturbances bring relatively cold, moist air from the Mediterranean region in the upper reaches of the atmosphere. The winds gain strength as they funnel through the Himalayas and enter the intensely hot north Indian plains. Interaction with hotter air in the low pressure zones of the Indo-Gangetic plains seems to have powered the storm activity. While extreme weather is worrying in itself, what adds to precariousness of the situation is the timing of western disturbances. Western disturbances are normally active over the Indian subcontinent towards the fag-end of winter and spring (February and March), beyond which the wind circulation gradually shifts northward and exits the subcontinent. However, in recent years, this pattern has been changing and the impacts have not gone unnoticed in India. “The western disturbances gradually shift to northern latitudes as summer gets established in India. So, it usually does not affect monsoon distribution. However, as the Arctic undergoes long-term warming, the temperature difference between the poles and the equator has reduced. This is changing the western disturbances which are active for longer in the Indian region and have started affecting weather in the pre-monsoon and monsoon seasons. Last year too, this is what contributed to a staggered start to the monsoon,” explains Deoras. In 2017, the monsoon was stalled over Kerala and coastal Karnataka for more than two weeks after upper circulation, under the influence of jet streams, did not allow monsoonal winds to progress over mainland India. The result was an extremely scattered distribution—both temporally and spatially—that persisted throughout the four months of monsoon. While 2017 saw some strong pre-monsoon showers in Central India due to western disturbances, the episodes were nowhere near as strong as those seen this year. Fears are that the scale and geographic scope of the storms might affect the strength of monsoon winds when they do arrive. The strength of the winds depends, in part, on the difference in temperature over the Indian landmass and the Indian Ocean. The hotter the land, the stronger are the winds. However, frequent storms effectively bring down the temperature near the surface, thus reducing the temperature gradient which influences the strength of rain-bearing winds. The IMD announced that a “normal” monsoon was likely in 2018 when it released its first long-range forecast for the season in mid-April. Since then, much has changed. To add to the disturbance caused by the string of recent storms, things seem to be becoming unfavourable for a normal monsoon in the Indian Ocean as well. The El Nino Southern Oscillation is still expected to remain neutral and have little to no impact on the monsoon. However, unfavourable conditions have developed closer home. While the Indian Ocean Dipole is currently neutral and would not have much of an impact on the monsoon, this could change very quickly. The Australian Bureau of Meteorology has forecast a steep dip in the Indian Ocean Dipole index from mid-May. 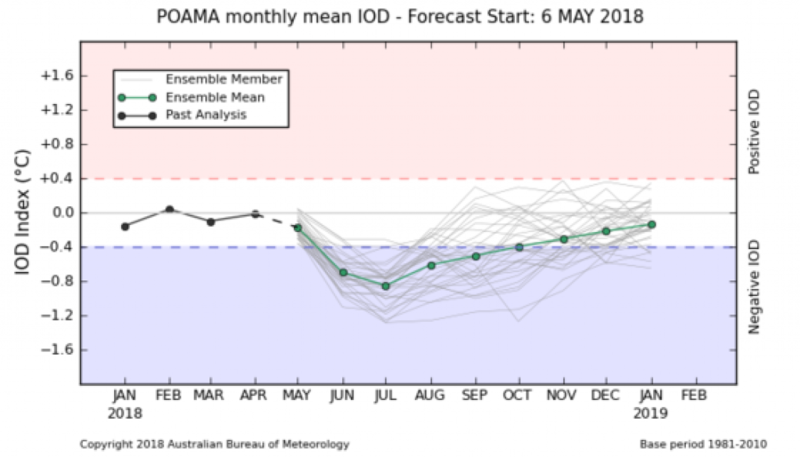 According to their simulations on May 6, IOD index will be close to -0.8 and -1.0 in June and July respectively, indicating strong negative IOD conditions. A negative IOD indicates that the eastern Indian Ocean, including the Bay of Bengal, is warmer than the western Indian Ocean that includes the Arabian Sea. Negative IODs have been known to impede the progress of the monsoon. This strong dip was not foreseen when the first forecast was prepared in mid-April. The met department is currently putting together the second forecast, which shall be released on May 15. While all eyes shall be on an increasingly uncertain date of onset, what is arguably more worrying is the overall health of the monsoon season. With new unseasonal storm almost every day, the cloud of uncertainty around monsoon only seems to grow bigger and darker.